The accused couple apparently dropped off the man's three children with his ex-wife before kidnapping the girls from their family's farmstand. OSWEGATCHIE, N.Y. – Life among the Amish in this northern New York community is easing back into a sense of normalcy a week after two young sisters were abducted from their family farm and as more detailed allegations emerge about their day in captivity. Smiling men waved from their buggies at passing strangers this week as the girls’ father stood with his arms draped loosely around two of his young boys, offering produce for sale at the farm stand where the 7- and 12-year-old girls were lured into a car Aug. 13. A young girl stood on the broad porch of the white farmhouse 20 yards behind him. The girls, who authorities say were sexually abused, were released when their captors were apparently spooked by an intense police investigation and media coverage, authorities said. The Associated Press is not naming the family members because it generally does not identify victims of sexual abuse. On Saturday, Nicole Vaisey, 25, and Stephen Howells Jr., 39, of nearby Hermon, were arrested on kidnapping charges. Nicole Vaisey didn’t speak during an hour-long preliminary hearing Thursday at which a town judge ordered her held without bail on a charge of second-degree kidnapping, punishable by 15 years to life in prison. So far she’s charged with one count. Howells, a registered nurse who had worked at a hospital, faces the same charge. He waived his right to a hearing, and the case will go to a grand jury. 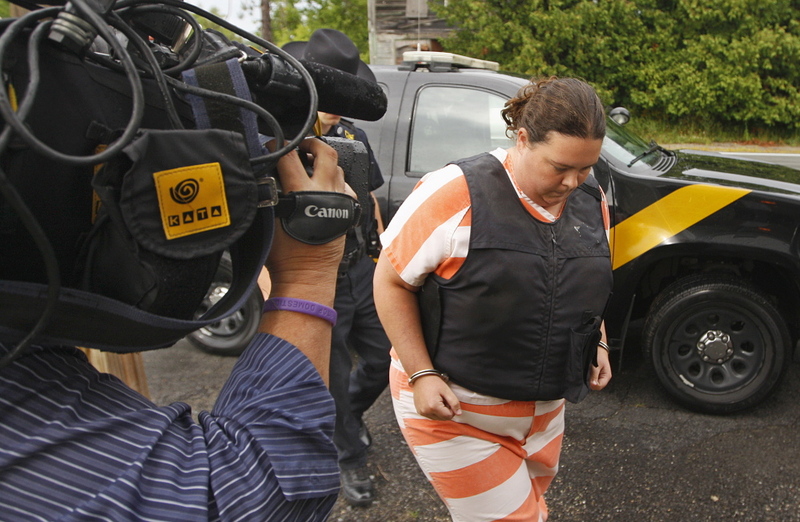 Wearing an orange-and-white striped jail jumpsuit, her wrists shackled to a chain at her waist, Vaisey showed no emotion while an investigator recounted her description of the abduction. St. Lawrence County Sheriff’s Sgt. Brooks Bigwarfe testified Vaisey told him that after they dropped Howells’ three children off with his ex-wife, the pair talked about kidnapping two children. She said Howells had met the two girls a week before buying produce at the farm stand. Vaisey called it “a shopping trip,” Bigwarfe said. “They were going to make the two kids their slaves,” he said. The couple picked up their dog, a mix of golden retriever and Doberman, put it in the backseat of their Honda Civic and drove to the stand, Bigwarfe said. Howells got out, invited the girls to pet the dog and opened the back door. The younger girl reached in as her older sister became apprehensive. Howells pushed both into the car as they screamed, and Vaisey sped off. At the couple’s house about 20 miles away down another country road with no nearby neighbors, the girls were handcuffed together at the ankles and then cuffed to a bed, authorities said. They were released to eat and use the bathroom. Howells and Vaisey got scared after seeing online media reports of the abduction and search, Bigwarfe said. Howells drove the girls to another rural town and let them go the next evening in an isolated area. He told them to get out of his car, go into the woods and not say anything. Instead, they knocked on the door of a home and were rescued. Defense attorney Bradford Riendeau asked for bail for Vaisey, noting the dog groomer is a lifelong resident of the area and has family here. He also said that would protect her from possible harm from other inmates at the jail. He said she drove herself to the sheriff’s office to talk to investigators and had been cooperative. Riendeau told the AP that Vaisey herself was the slave of Howells, and that he is sadomasochistic. Howells’ lawyer has not returned calls seeking comment. District Attorney Mary Rain opposed bail, offering the judge and Riendeau copies of Howells’ sealed statement, saying it showed assault against the girls by Vaisey. Rain said she is equally culpable. From his home in Deary, Idaho, Howells’ father declined to talk about his son but offered sympathy to those affected by the case.